It’s time to fire up those grills, my friends! It’s back to school time but that doesn’t mean summer is completely over, right? 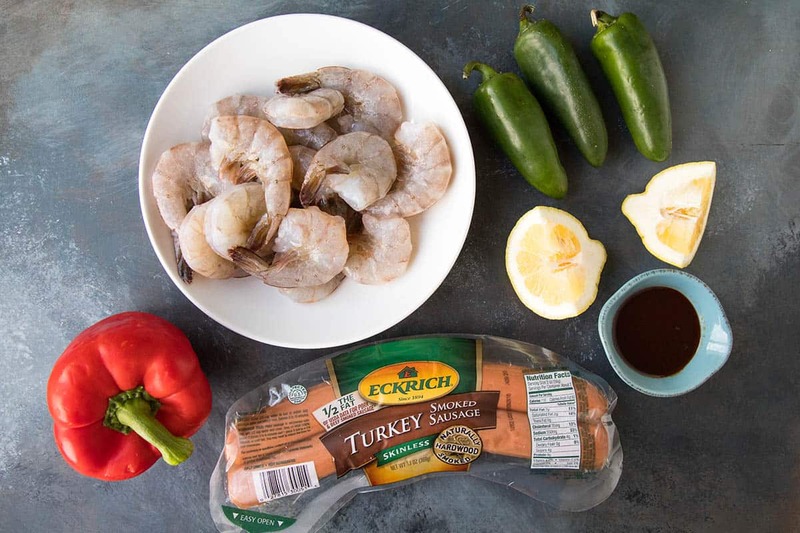 In fact, using the grill can make for some super quick and easy meals, especially when you’re cooking with Eckrich Smoked Sausage. What I LOVE about Eckrich Smoked Sausage is that you can go from hmmm to mmm with it’s natural smoked flavor and the excellent blend of spices that give it that rich, savory taste. PLUS! It’s such a versatile ingredient, it’s a great go-to for quick and VERY easy family meals. This particular recipe cooks up crazy fast so you can spend less time grilling, and more time living! 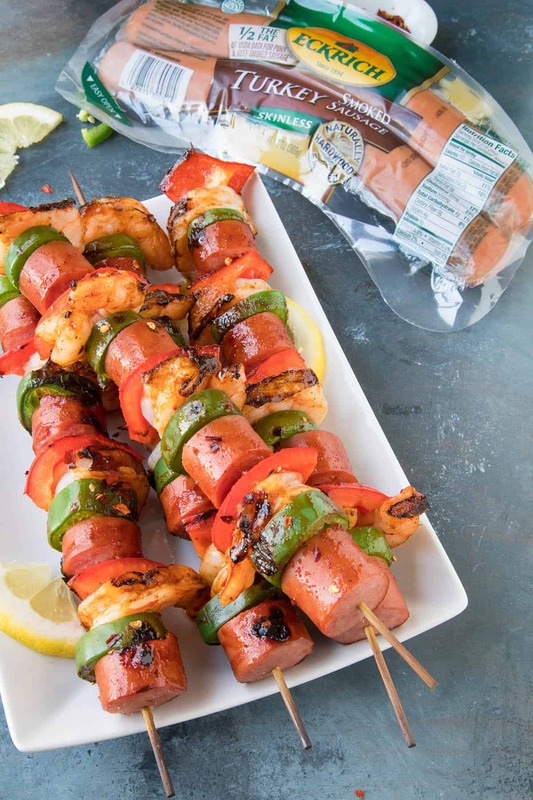 We’re talking Grilled Shrimp and Sausage Skewers, my friends! With a nice and spicy chili glaze that you can whip together in no time. YES! First! Let’s gather up our ingredients. Here they are. Make your spicy chili glaze by whisking together a bit of gochujang, rice vinegar, lemon juice and salt. If it is too thin for your tastes, add in a bit more gochujang. Next, slice the Eckrich Smoked Sausage into ¾ inch slices. You should wind up with 24 pieces total. 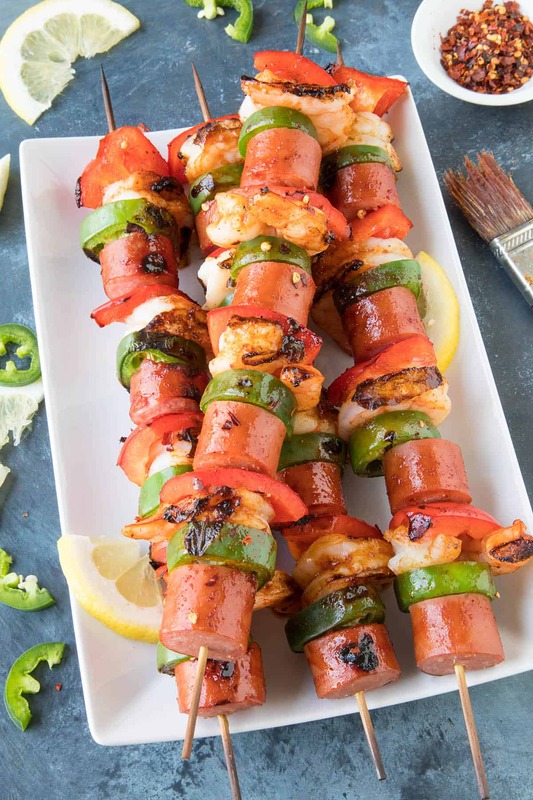 Using 10-inch wooden skewers, pierce each with a slice of sausage, a jalapeno slice, a piece of shrimp, then a slice of red bell pepper. Repeat. Each skewer should hold 16 pieces. 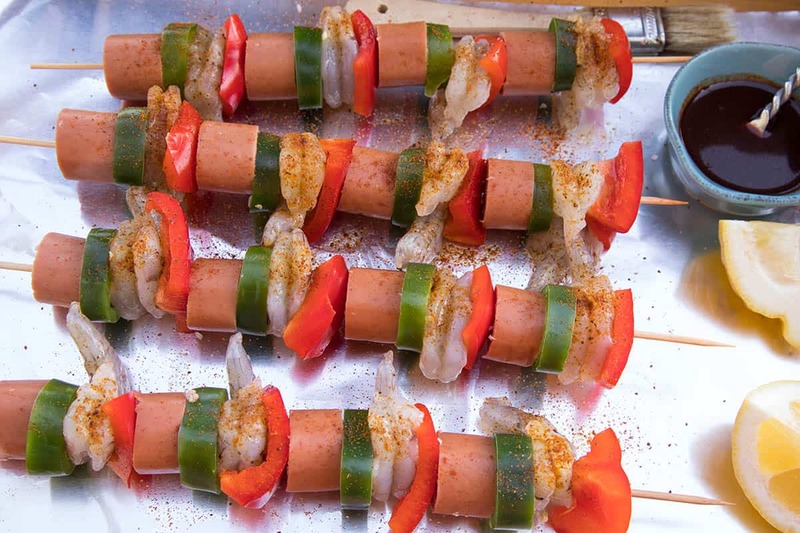 Sprinkle each skewer with garlic powder, chili powder, and salt and pepper to taste. Next, fire up your grill to medium heat and lightly oil the grates. Set the shrimp and sausage skewers on the grill and brush them with the chili glaze. Grill for 4-5 minutes, then flip and brush them again. Cook another 4-5 minutes, or until the shrimp is cooked through and the peppers soften up. Drizzle with freshly squeezed lemon juice and serve them up! They are incredibly tasty and perfect for your easy family meals. And super EASY! 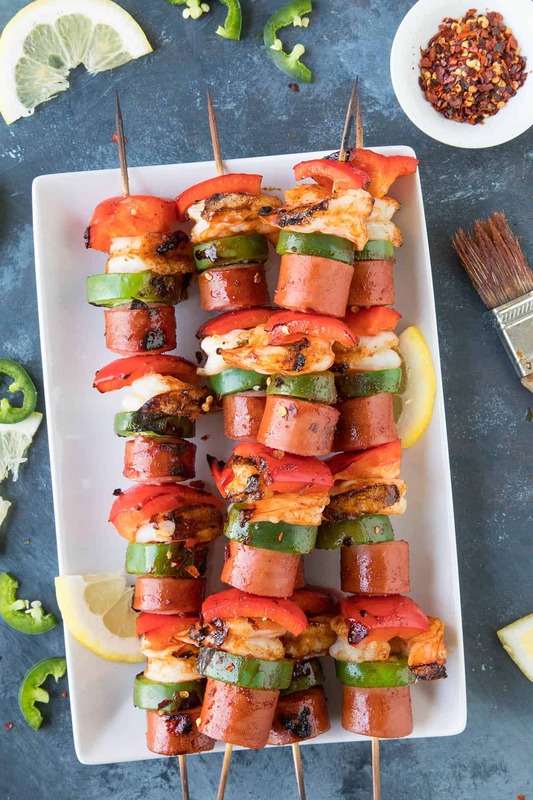 Time-saving Tip: Skewers can be made ahead of time for parties or large families and grilled all at once! Isn’t it AWESOME when big flavor takes practically no work? I think so! Visit the Eckrich web site today for recipes and promotions. You can find Eckrich Smoked Sausage in the deli section of your local grocery stores. Slice the Eckrich Smoked Sausage into ¾ inch slices. You should wind up with 24 pieces total. 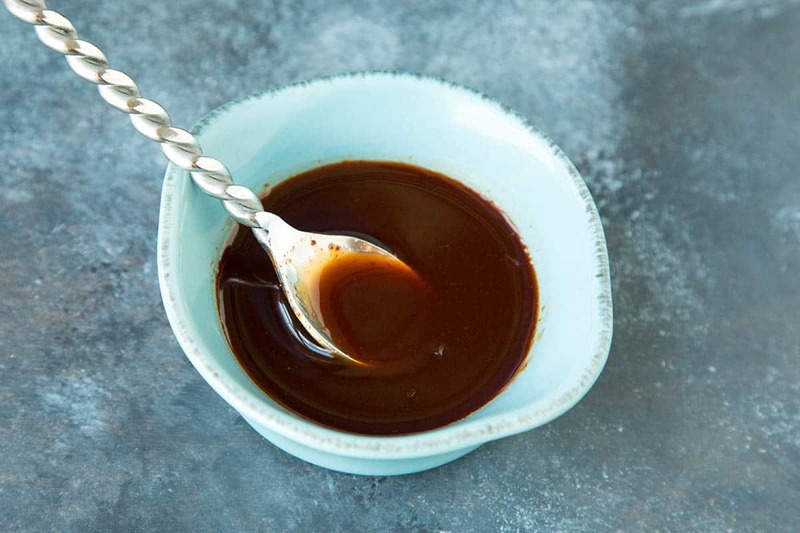 For the glaze, whisk together the gochujang, rice vinegar, lemon juice and salt. If it is too runny, add in more gochujang. Fire up your grill to medium heat and lightly oil the grates. 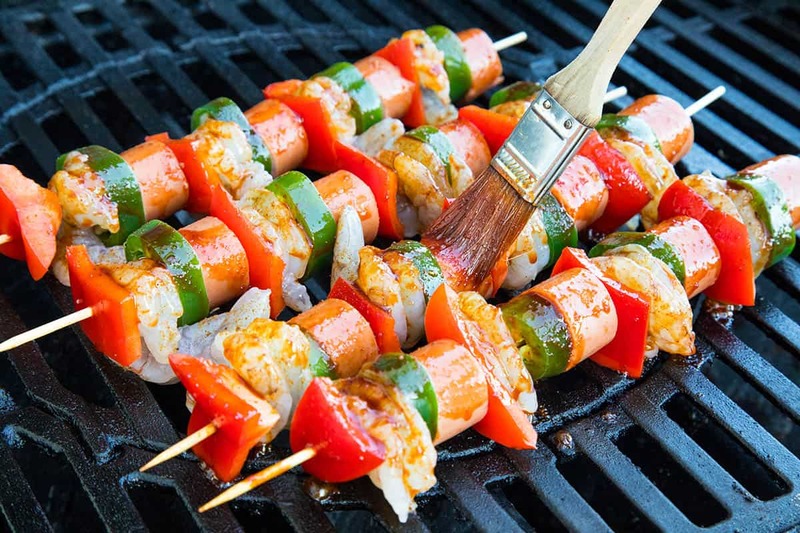 Set the shrimp and sausage skewers on the grill and baste them with the chili glaze. Grill for 4-5 minutes, then flip and baste them again. Cook another 4-5 minutes, until the shrimp is cooked through and the peppers soften up. Drizzle with freshly squeezed lemon juice and serve!